Enter. Within these walls are works that will confound, surprise and delight. 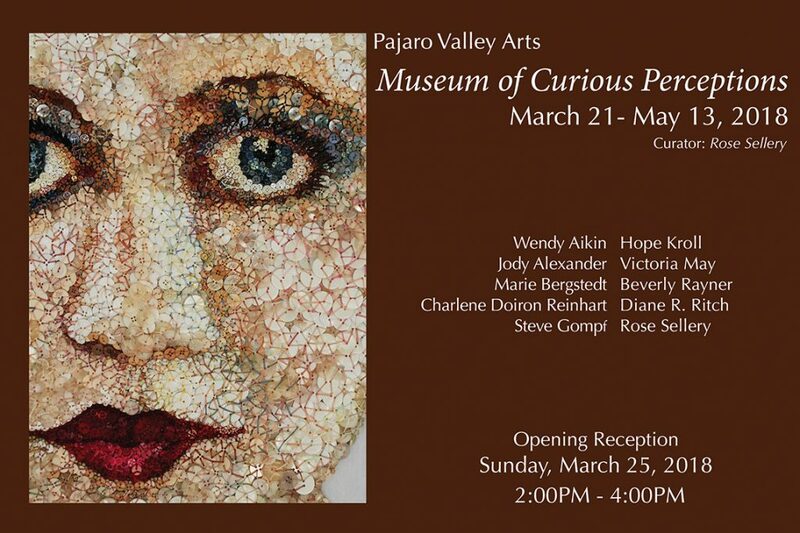 Pajaro Valley Arts presents an eclectic gathering of meticulous collections transforming it into Spoken/Unspoken: Museum of Curious Perceptions. The story tellers. Their words reverberate throughout the galleries… unsounded whispers, mute cries, gagged laughter, thunderous unheard sighs– the splintering profundity of their unspoken words resound silently throughout each exhibit within this fictional museum. Look, watch and listen with your imagination. The artists in each of the exhibits mold and twist, conjure, proclaim, contort and extract a story from objects mundane and sublime. Be transported. Enter their stories. Wendy Aikin, Jody Alexander, Marie Bergstedt, Charlene Doiron Reinhart, Steve Gompf, Hope Kroll, Victoria May, Beverly Rayner, Diane R. Ritch, Judy Stabile and Rose Sellery. This event will be open to the public, and is free of charge. Join curator Rose Sellery, and some of the participating artists to gain insights into our Museum of Curious Perceptions.